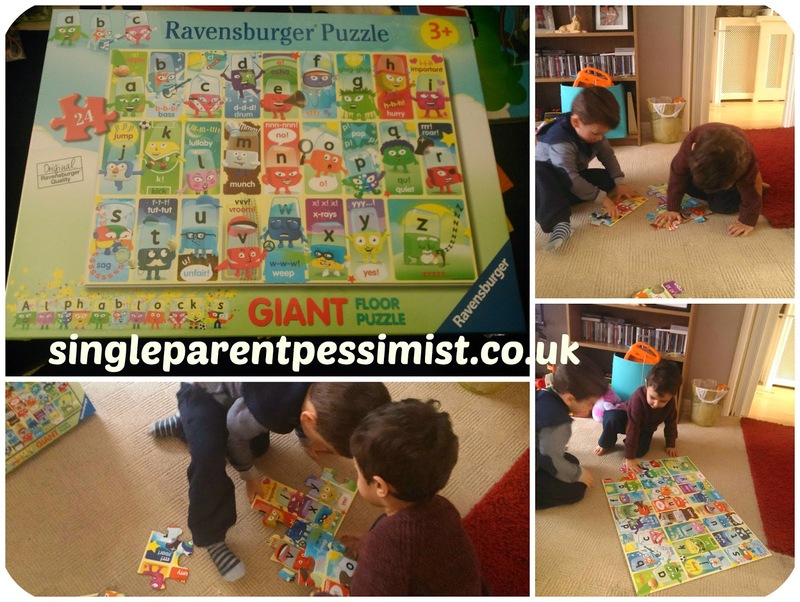 Chunk has loved floor puzzles since he was given his very first one to review nearly a year ago, so he was very pleased to have another one from Ravensburger and this one was a lot bigger! The Alphablocks Giant Floor Puzzle has 24 large pieces and is aimed at children from the age of 3. Chunk is nearly 3, and his first attempt at the puzzle was completed with the help of his cousin Curly who is nearly 4. I usually help guide them when it comes to puzzles they haven't done before, but I wanted to see how they would do without any help. I was pleasantly surprised that they worked TOGETHER (they fight like cat and dog these days as there's only 9 months between them) and they completed the puzzle within ten minutes without any adult help! They worked as a team, they helped each other find the right Alphablocks to put into the sequence and they enjoyed themselves. Over the day they kept getting it out to do again and got faster each time. The boys watch The Alphablocks on Cbeebies so were pointing out each of the letter characters and over the next few weeks I will try to keep pointing out the phonics with them as they do the puzzle, which is a great bit of learning play! I find it difficult to be negative about puzzles because I think they are great toys for young children for both educational and hand-eye coordination skills. I was provided with The Alphablocks Floor Puzzle for the purpose of this review. No payment was received and all opinions are honest and my own.